178 pages | 7 B/W Illus. Cognitive Behavioral Therapy for Preventing Suicide Attempts consolidates the accumulated knowledge and efforts of leading suicide researchers, and describes how a common, cognitive behavioral model of suicide has resulted in 50% or greater reductions in suicide attempts across clinical settings. Simple and straightforward descriptions of these techniques are provided, along with clear explanations of the interventions’ rationale and scientific support. Critically, specific adaptations of these interventions designed to meet the demands and needs of diverse settings and populations are explained. 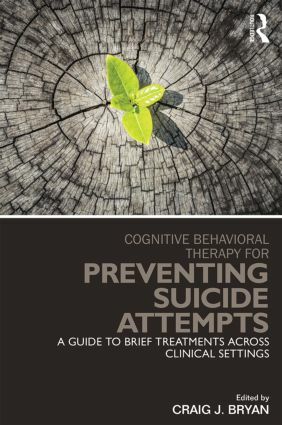 The result is a practical, clinician-friendly, how-to guide that demonstrates how to effectively reduce the risk for suicide attempts in any setting. Craig J. Bryan, PsyD, ABPP, is a board-certified clinical psychologist in cognitive behavioral psychology and is currently the executive director of the National Center for Veterans Studies and an assistant professor in the department of psychology at the University of Utah.